TurboTax Premier 2012 is essentially the mirror image, in a desktop application, of Intuit’s new iPad version of TurboTax. 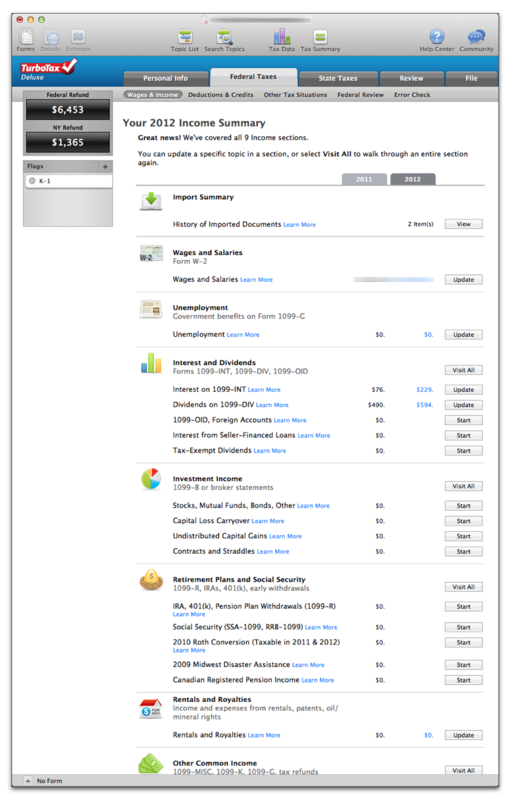 (Which is to say that Intuit has done a great job of migrating a desktop app to iOS.) As always TurboTax helps you make quick work of filing your personal taxes and is now, for the very first time, offered as a free download from Apple’s Mac App Store. Good Guidance: TurboTax 2012 helps you navigate your personal tax needs with clear questions and a minimum of heartburn. 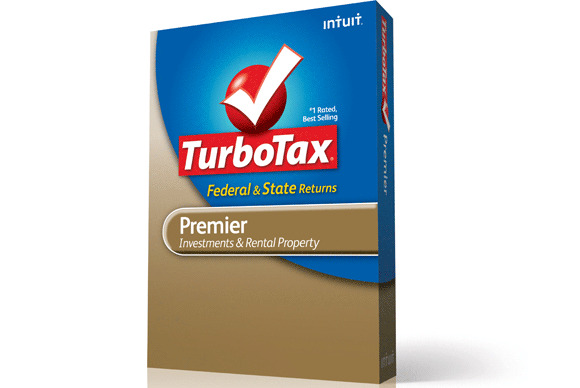 TurboTax comes in four different flavors: Basic, Deluxe, Premier, and Home & Business. Each offers increasingly more sophisticated sets of features designed to fill your specific tax needs. Basic handles your return if you don’t itemize deductions and requires you to purchase a state return. Deluxe is meant for tax filers who own a home, have children, and itemize deductions. Premier includes forms for stocks, bonds, mutual funds, and rental properties. Home & Business adds options for self-employment income. If you buy the software from your local retail store you’ll need to make sure you purchase the version suited to your specific needs. If you choose to download TurboTax 2012 from the App store, how you answer questions during the interview process will determine the version of TurboTax 2012 you’ll pay for at the time you file your taxes. As is the case with every version of TurboTax, TurboTax 2012 starts with an interview process, which includes an option for importing data from last year’s return. This data can be imported from a return created with TurboTax 2011 or PDFs created using H&R Block At Home and TaxACT. Importing data allows you to bypass some basic data entry, although you’ll want to review the imported data to make sure it’s accurate. Also, if your company’s payroll company is supported, you can enter your employer’s EIN and TurboTax 2012 can retrieve your W-2 information automatically. Oddly, save for the Mac mini, even though every Mac now ships with a camera, there is no option for taking a picture of your W-2 and using OCR to automatically import the data. TurboTax 2012 offers three different options for filling out your tax forms. The first is EasyGuide, which takes a step-by-step approach through your tax return, asking you questions and then adding the appropriate forms to your return as necessary. An Explore on My Own option lets you choose the specific deductions and credits you want to work on, while still guiding you through a general interview process. The final option is a form view that allows you to add, view, and enter data into actual IRS tax forms without an interview process—believe it or not, this is a method that some people prefer to use. Once the interview process is complete TurboTax 2012 double-checks your return to see whether or not you have conflicts (for example, did you take deductions for both depreciation and mileage on a vehicle you use for business?) and verifies that the forms you are filing are up to date. When you finish you can file your returns electronically from within the app. There is one other important note about the differences between the App Store and boxed product versions of TurboTax 2012: You will need to pay a fee for every time you file taxes using the App Store version of the product while the filing fee for the boxed product is included in the price you pay at the store and does not include any filing limitations. This is important if you’re married but file taxes separately from your spouse or if you’d like to make the application available to someone else in your home who needs to file a return. TurboTax 2012 remains the best, easiest to use tax filing product on the market, simplifying and taking the scariness out of the tax filing process. Which is why TurboTax remains the only reason I’m willing to file my personal taxes on my own.